Dekliderm is a revolutionary new liquid foundation that goes on white and instantly self-adjusts to match your EXACT skin tone. Our Unique color-matching formula protects and moisturizes the skin as it works to even out your complexion. 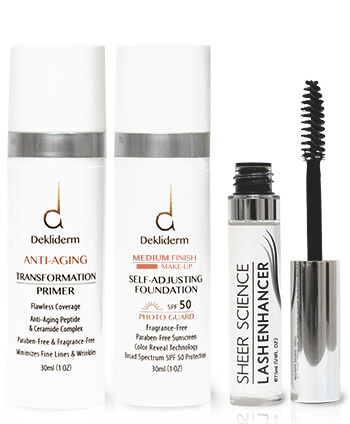 Dekliderm™ foundations contain SPF 50 sun protection to shield your skin from harmful UVA and UVB rays. It is designed for daily use and will give your skin that illuminating silky finish other foundations just don't provide. Our fragrance-free formula is lightweight and quickly absorbs onto the skin without any dryness or caking. Dekliderm is a revolutionary new liquid foundation that instantly matches your skin tone. The unique color-matching formula protects and moisturizes the skin as it works to even out your complexion. 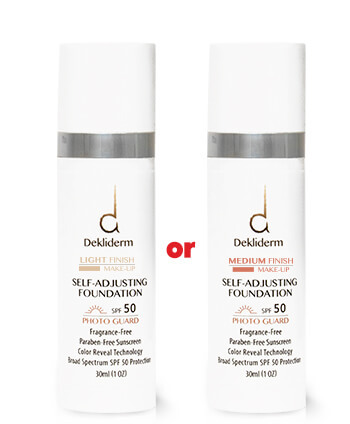 Dekliderm Self-Adjusting Foundation contains SPF 50 sun protection to shield your skin from harmful UVA and UVB rays. It is designed for daily use and will give you skin that illuminating silky finish other foundations just don't provide. This advanced formula delivers the perfect coverage for an impeccable appearance. It's extremely lightweight and contains powerful peptides and ceramides to minimize the appearance of fine lines and wrinkles. 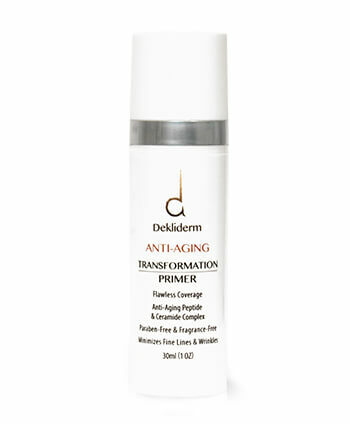 Use Dekliderm Transformation Primer before the Self-Adjusting foundation for truly flawless looking skin. Medium is best for slightly tan to more olive skin tones. If your skin is on the fairer side, then our light foundation should be a perfect match. Do you have a lot of freckles? Do you burn easily in the sun? 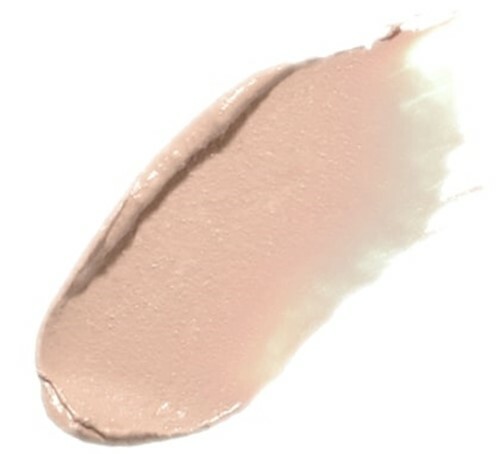 Does your skin have pink, neutral or yellow undertones? The LIGHT FINISH is best for you. Do you have slightly tan to olive skin? Do you tan easily and rarely burn? Does your skin have golden or honey undertones? The MEDIUM FINISH is best for you. If you already have a good primer the Dekliderm Self-Adjusting Foundation will still work great (although we highly recommend the Transformation Primer). This revolutionary new foundation is the only thing you'll ever need for the perfect match EVERY time! The powerful combination of our Primer and Foundation will have you looking years younger in minutes. The Self-Adjusting Foundation instantly matches to your skin tone, creating the perfect shine-free finish. The Transformation Primer smooths and softens the skin as it works to visibly reduce fine lines and wrinkles. Plus you get a FREE HA Lash Enhancer to promote fuller, thicker, longer-looking lashes. Our medium tone works well with most skin colors, and is espically great during the summer months when many may have a tanner skin tone. 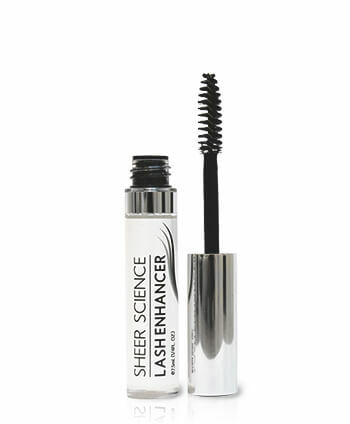 Our HA Lash Enhancer conditions your lashes using Hyaluronic acid and contains glycoproteins which help to increase lash flexibility and prevent breakage. Just apply the serum prior to your mascara to visibly add substantial length and thickness, giving your lashes the fuller, healthier, more attractive look you want. 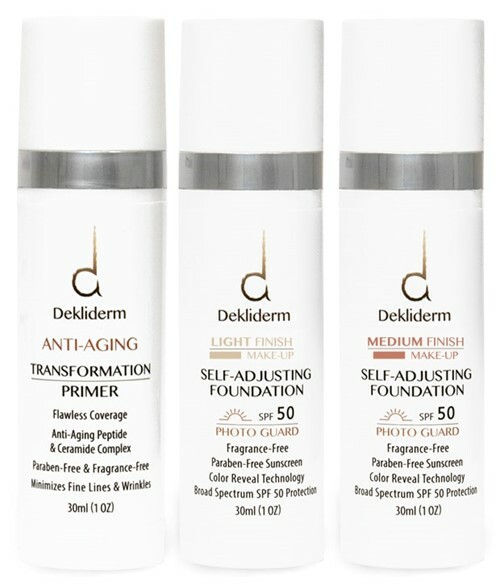 Customers Love Dekliderm Transformation Primer because it creates a perfectly smooth, even surface to apply our Self-Adjusting Foundation. It's practically weightless and contains powerful anti-aging ingredients that can help minimize the appearance of fine lines and wrinkles. It's the perfect first step to create flawless-looking skin. Copyright © 2019 Sheer Science. All rights reserved.